As Head of State The Queen has to remain strictly neutral with respect to political matters, unable to vote or stand for election, however Her Majesty does have important ceremonial and formal roles in relation to the government of the UK. The formal phrase 'Queen in Parliament' is used to describe the British legislature, which consists of the Sovereign, the House of Lords and the House of Commons. The Queen's duties include opening each new session of Parliament, granting Royal Assent to legislation, and approving Orders and Proclamations through the Privy Council. The Queen also has a special relationship with the Prime Minister, retaining the right to appoint and also meeting with him or her on a regular basis. In addition to playing a specific role in the UK Parliament based in London, The Queen has formal roles with relation to the devolved assemblies of Scotland, Wales and Northern Ireland. The phrase 'Crown in Parliament' is used to describe the British legislature, which consists of the Sovereign, the House of Lords and the House of Commons. Of these three different elements, the Commons, a majority of whom normally supports the elected Government of the day, has the dominant political power. The role of the Sovereign in the enactment of legislation is today purely formal, although The Queen has the right ‘to be consulted, to encourage and to warn’ her ministers via regular audiences with the Prime Minister. The Sovereign’s assent is required to all bills passed by Parliament in order for them to become law. Royal Assent (consenting to a measure becoming law) has not been refused since 1707. It is also a long established convention that The Queen is asked by Parliament to provide consent (which is different to assent) for the debating of bills which would affect the prerogative or interests of the Crown. Where Queen’s Consent is given it is signified in each House of Parliament and recorded in Hansard. Consent has not been withheld in modern times, except on the advice of Government. In the annual State Opening of Parliament ceremony, The Queen opens Parliament in person, and addresses both Houses in The Queen's Speech. Neither House can proceed to public business until The Queen's Speech has been read. This speech is drafted by the Government and not by The Queen. It outlines the Government's policy for the coming session of Parliament and indicates forthcoming legislation. Under the terms of the Fixed-term Parliaments Act (2011), each Parliament consists of five twelve-month sessions. While each session is opened by The Queen in person at the State Opening, the session is closed (prorogued) in The Queen's name with a speech read in the House of Lords, and in the presence of the Commons, by the Leader of the Lords. When Parliament is summoned after a Royal proclamation there must, according to the Representation of the People Act 1918, be a period of at least twenty days before Parliament meets. This period can be extended, but only for fourteen days, according to the Prorogation Act 1867. There is only one occasion on which Parliament meets without a Royal summons, and that is when the Sovereign has died. In such circumstances, the Succession to the Crown Act 1707 provides that, if Parliament is not already sitting, it must immediately meet and sit. The Meeting of Parliament Act 1797 provides that, if the Sovereign dies after Parliament has been dissolved, the immediately preceding Parliament sits for up to six months, if not prorogued or dissolved before then. The Queen has a special relationship with the Prime Minister, the senior political figure in the British Government, regardless of their political party. Although she is a constitutional monarch who remains politically neutral, The Queen retains the ability to give a regular audience to a Prime Minister during his or her term of office. The Queen gives a weekly audience to the Prime Minister at which she has a right and a duty to express her views on Government matters. If either The Queen or the Prime Minister are not available to meet, then they will speak by telephone. These meetings, as with all communications between The Queen and her Government, remain strictly confidential. 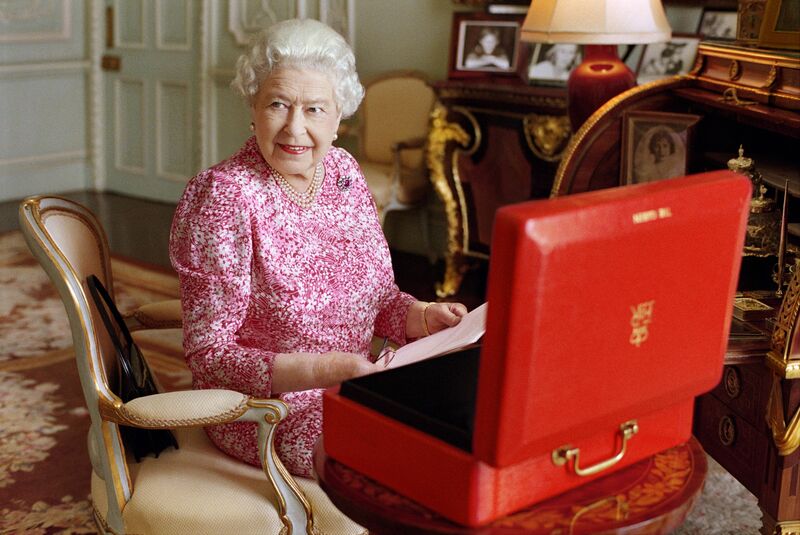 Having expressed her views, The Queen abides by the advice of her ministers. After a general election, the appointment of a Prime Minister is the prerogative of the Sovereign. In appointing a Prime Minister, the Sovereign is guided by constitutional conventions. The main requirement is to find someone who can command the confidence of the House of Commons. This is normally secured by appointing the leader of the party with an overall majority of seats in the Commons, but there could still be exceptional circumstances when The Queen might need to exercise discretion to ensure that her Government is carried on. When a potential Prime Minister is called to Buckingham Palace, The Queen will ask him or her whether he or she will form a government. To this question, two responses are realistically possible. The most usual is acceptance. If the situation is uncertain, as it was with Sir Alec Douglas-Home in 1963, a potential Prime Minister can accept an exploratory commission, returning later to report either failure or, as occurred in 1963, success. After a new Prime Minister has been appointed, the Court Circular will record that "the Prime Minister Kissed Hands on Appointment". This is not literally the case. In fact, the actual kissing of hands will take place later, in Council. Since 1999 Scotland has had two Parliaments: one in Edinburgh for devolved, domestic matters, and the other at Westminster for UK-wide issues. Scotland had its own Parliament until the Act of Union of 1707, when the Parliament in London took responsibility for legislation in Scotland. In a referendum on 11 September 1997, a majority of the Scottish public voted in favour of a Scottish Parliament. The first session was held on 12 May 1999 and the Scottish Parliament was officially opened by The Queen on 1 July 1999 in its temporary building on the Mound in Edinburgh. The new Scottish Parliament building was formally opened by The Queen on 9 October 2004. The building is sited opposite the Palace of Holyroodhouse and The Queen's Gallery in Edinburgh. With 129 members (including the Presiding Officer) elected every four years, the Scottish Parliament can introduce primary legislation and is responsible for a portfolio which includes education, health, law, environment, economic development, local government, housing and police. It also has the power to vary the basic rate of income tax by up to three pence in the pound. Under legislation which established the Scottish Parliament, Members of the Scottish Parliament take the oath of allegiance to the Crown. The Queen also receives a weekly report from the Scottish Parliament on its business, given its specific legislative role. The Queen appoints the Scottish First Minister and has regular audiences with him or her to keep up to date with Scottish affairs. A referendum in 1997 saw the public vote in favour of a National Assembly for Wales. The first elections were held on 6 May 1999, and elections are held every four years. The Assembly was officially opened on 26 May 1999 in Cardiff, a ceremony in which The Queen and The Prince of Wales played prominent roles. Both The Queen and The Prince of Wales spoke at the opening ceremony in the temporary Assembly building. During the ceremony The Queen symbolically signed a document on which was written the opening words of the Government of Wales Act. 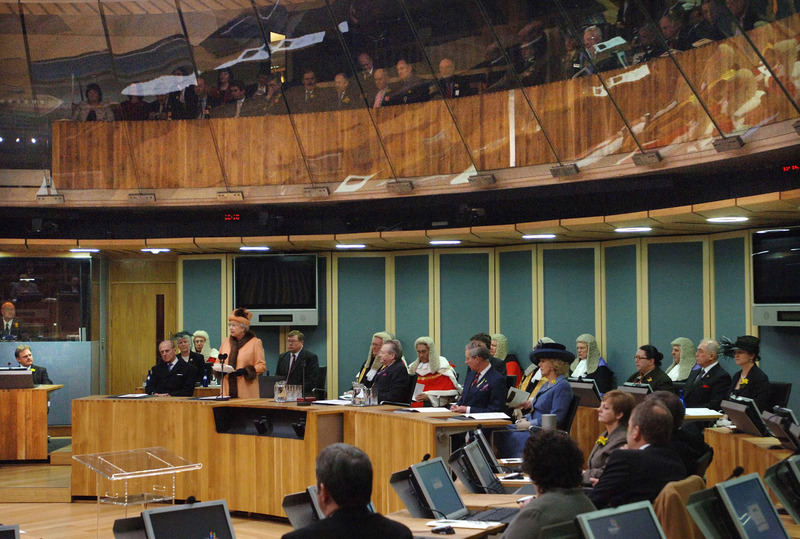 On 1 March 2006, The Queen opened the permanent home for the National Assembly for Wales in Cardiff. The Assembly has 60 members (including the Presiding Officer). It can introduce legislation, in devolved areas such as health, training, environment, housing, tourism and agriculture. It has no powers to alter income tax, but it does allocate the funds made available to Wales from the Treasury of the UK. Wales remains within the framework of the United Kingdom, and laws passed in Parliament in Westminster still apply to Wales. The Government of Wales Act 2006, which came into force in May 2007, assigned to The Queen new ceremonial functions of formally appointing Welsh ministers and granting Royal Assent to Acts of the Assembly. In addition, the Assembly staff are members of Her Majesty's Home Civil Service. The Northern Ireland Assembly was established as part of the Good Friday Agreement of 10 April 1998 as the prime source of authority for all devolved responsibilities. A total of 108 members were elected to the Assembly on 25 June 1998 by Proportional Representation (Single Transferable Vote) from the existing 18 Westminster constituencies. The Assembly was given full legislative and executive authority in respect of those matters previously within the remit of six Northern Ireland government departments: the Departments of Agriculture, Economic Development, Education, Environment, Finance and Personnel, and Health and Social Services. The Queen met members of the Assembly when she visited the Assembly building at Stormont as part of her Golden Jubilee tour of the United Kingdom in 2002, and again in 2005, and in her Diamond Jubilee tour in 2012. The Queen is Head of the Privy Council. This is the oldest form of legislative assembly still functioning in the UK, responsible for a number of executive responsibilities. Its origins date from the court of the Norman kings, which met in private - hence the description 'privy'. Until the seventeenth century, the king and his Council were the government, with Parliament's role limited to voting funds. Today, in a system of constitutional monarchy, the Privy Council retains some limited, formal functions. For example, the Privy Council is concerned with the affairs of Chartered Bodies, the 400 or so institutions, charities and companies who are incorporated by Royal Charter. The Privy Council also has an important part to play regarding certain UK statutory regulatory bodies covering a number of professions (mainly in the healthcare field) and in the world of higher education. The Privy Council is involved in the arrangements for the appointment of the High Sheriffs of England and Wales, except for the Duchy of Lancaster and Cornwall, and for many Crown and Privy Council appointments to governing bodies. The Privy Council also has certain judicial functions. It is the court of final appeal for the UK overseas territories and Crown Dependencies, and for those Commonwealth countries that have retained the appeal to Her Majesty in Council, including Jamaica, Barbados, Antigua and Barbuda, Belize and Tuvalu. The Privy Council meets on average once a month, at Buckingham Palace, Windsor Castle, or, occasionally, Balmoral. Councils are held by The Queen and are attended by Ministers and the Clerk of the Council. At each meeting the Council will obtain The Queen's formal approval to a number of Orders which have already been discussed and approved by Ministers, much as Acts of Parliament become law through the giving of the Royal Assent after having been debated in Parliament. In addition, The Queen approves Proclamations through the Privy Council. These are formal notices which cover issues such as the summoning of a new Parliament, coinage and the dates of certain Bank Holidays. Privy Council meetings are reported in the Court Circular, along with the names of Ministers attending (usually four in number). The Orders made at each Council are in the public domain, and each bears the date and place of the Council at which it was made. There is therefore nothing at all 'secret' about Privy Council meetings today. There are 400 Privy Counsellors. They consist of all members of the Cabinet, a number of middle-ranking government Ministers, leaders of the opposition parties, senior judges and some appointments from the Commonwealth.